Used to configure various settings in this machine. Used to connect an external memory unit (USB memory unit) to this machine. Open this door to clear a paper jam. Press this switch to turn the machine on or off. Used to lock the Right Door. Used to print data on irregularly size paper, thick paper, transparencies, postcards (4 6 (A6 Card)), envelopes, or label sheets. The Bypass Tray can hold up to 100 sheets of plain paper, 20 sheets of Thick 1, 20 sheets of Thick 1+, 20 sheets of Thick 2, 20 sheets of Thick 3, 20 transparencies, 20 postcards (4 6 (A6 Card)), label sheets, or index paper, and 10 envelopes. Allows you to load up to 500 sheets. These trays can hold up to 150 sheets respectively of Thick 1, Thick 1+, Thick 2, and Thick 3. Open this door to replace the Toner Cartridge, Waste Toner Box, or Drum Unit. Flashes or lights up to indicate the data receiving status on this machine. Press this key to switch to the Power Save mode. During the normal operation, the key lights up blue. During the power save mode, the key flashes blue or lights up orange. Used to select a menu on the Touch Panel, or enter characters. Flashes or lights up to indicate that a problem has occurred in this machine. Used to supply power to this machine. Connect to this port when using this machine as a USB-connected printer. Connect to this port when using this machine as a network printer or network scanner. The network port of this product is following No.2 and No.3. 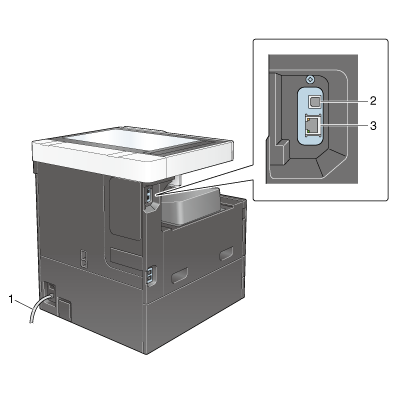 A port is activated when a network port inserts a cable. Used to load the original. Open this lever when clearing a paper jam in the fusing unit. Used to fuse toner to paper using heat and pressure. Used to transcribe toner onto paper. Used to create a print image. Used to remove the Drum Unit. Used to collect used waste toners. 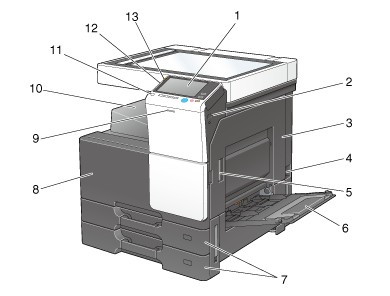 Contains toner, with which a print image is created. Used to scan an original image when using the ADF. Load the original along this scale. This scale is also used to check the size of the loaded original.